Historic floods in Houston, Texas. The triangle between Houston, Dallas, and Austin/San Antonio is sometimes known as flash flood alley, but this is getting to be a bit ridiculous. At one point on Thursday, flash flood watches covered more than 183,000 square miles of Texas, an area about the size of Germany and England combined. More than 15 inches of rain fell just northeast of Houston in a span of 12 hours on Thursday, just a few days after more than 20 inches fell in two days northwest of the city—the region’s second 100-year rainstorm in less than a week. (Statistically, a 100-year rainstorm is a rainfall event that has a 1 percent likelihood of occurring in a given year based on that region’s climate history.) The Brazos River west of Houston has crested more than four feet higher than previous record levels. Five soldiers died on Thursday at Fort Hood, north of Austin, when their military vehicle overturned in floodwaters during a training exercise. Gov. Greg Abbott has declared a state of disaster in 31 Texas counties to help speed the flow of aid. Last month, Austin’s rainfall was 390 percent of normal, and heavy rains there on Thursday exacerbated the situation. Texas has always been a land of weather extremes—in 1927, an unnamed National Weather Service meteorologist famously said “Texas is a land of perennial drought, broken by the occasional devastating flood”—but what’s happening now seems more extreme than ever. The current floods are happening just five years after the driest year on record in Texas, in which statewide rainfall was just 14.88 inches. Brenham, Texas, about 50 miles northwest of Houston’s suburbs, got more than that in just one day last week. For southeast Texas, this is at least the sixth major flood in just the past 12 months. Houston received more than 10 inches of rainfall in May, June, and October of 2015, and in April and May of this year, and has already racked up more than 7.5 inches in the first two days of June. (It’s still raining there as I type this.) April’s “Tax Day” deluge in Houston was estimated by the local flood control district to be a one-in-10,000 year rainfall event. Texas has seen some of the most drastic change in the United States, with Houston registering a 167 percent increase in the biggest downpours since the 1950s. Combined with rapid population growth and a laissez faire urbanization policy that prioritizes parking lots over flood control, Houston is nearing a breaking point. At the moment, the region’s reservoirs are full and unable to release more water without adding to the deluge. With land prices cheap, acres of swamp and grasslands are being cleared for more subdivisions—cutting into the city’s natural defenses and creating a billion-dollar flooding problem. 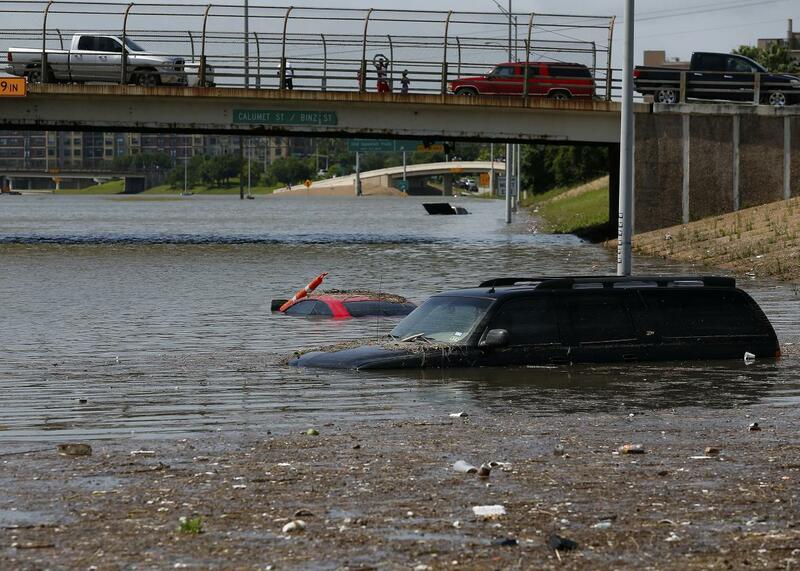 A drive into Houston these days is a glimpse of a future where weather has gone wild. Houston is a case study in what happens when a changing climate crashes head-on with a city that hasn’t done anything to stop it.